As it's been happening in time, here it is, unfolding for you, a love affair between my creativity and the unknown. My activities in Visual Arts started with PEN and INK DRAWINGS, lyrical and metaphoric, meant to illustrate my poems. REPORTAGE from Infinite Journey, which you find here in ENGLISH, POLSKI and DEUTSCH. True painting adventure started with MONOTYPES 1972, thousands and thousands papers painted in a learning process, not presented here. 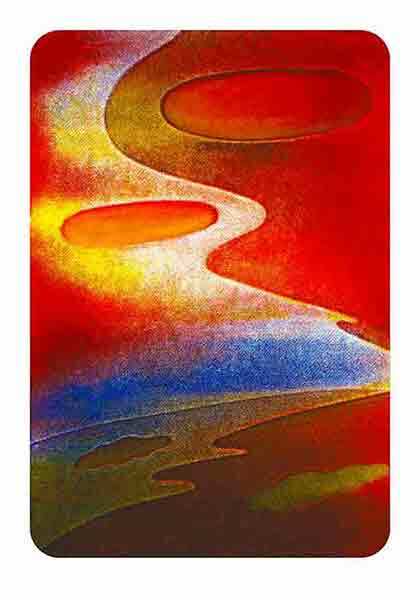 PRINT - because I was using print or graphic inks, PAINTING - because the colors were placed by the roller, quite a physical work, one color a day. Made several versions of every painting, using different color set. Offered my artwork in West-Berlin, Stockholm and Amsterdam galleries. 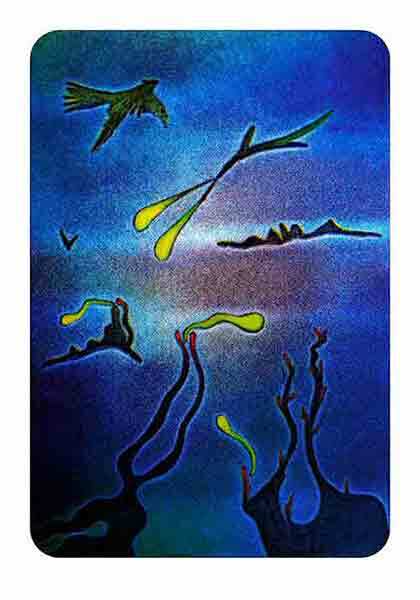 1975, in multi-layered colors my late Print-Paintings, abstract, three basic colors only. All the Print-Painting adventure took three years in Stockholm, Warsaw, Amsterdam and West-Berlin in the top form of creativity! Ended with an accident: for a month immobilized, what I describe on pages. creation - the natural state of being. 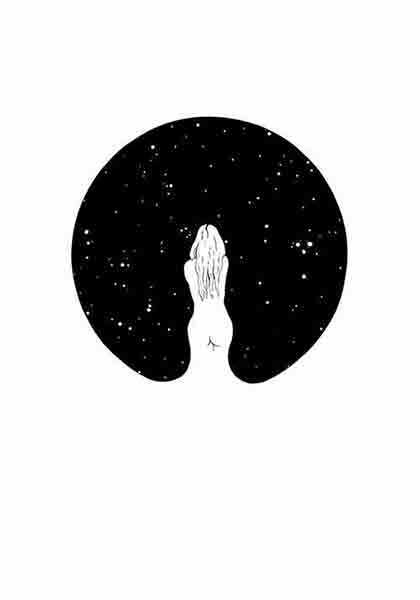 express the relationship of Man to Cosmos. Thick textured oil paints on canvas, contrasted with many-layered transparent brushwork. Love rules ok, allow my brushes to act inspired. on their way into the Light, the same time and techniques. Riding high on the waves of inspiration. Stockholm, Warsaw, West-Berlin. Mr. Brush soaring through colors into the Light of the Beginning. oil & acrylic masterpieces, thin half-transparent multi-layered brushwork. One motif only in many plights. Mysterious at the time being, when paintings were painted. Then 1982 I was introduced into Yoga of Light, and saw all those happy visions as painted in premonition of the Third Eye. and periods of poverty lasted till day before yesterday my friend! is testing aggressive feelings in paintings created faster than I could see. signs of being on the black of the unknown. Knowing and feeling united. Acrylics, hand or hands as tools, painting done in a second. microtimes ruling OK on Papers, aggressive moods, painting knife technique discovered/explored in life. throwing the paints onto the black, original Paintings done without touching the image. Triumphal Hail for the Resurrected. Painting-action in Kreuzberg 1986, size 700 x 500 cm. Landscapes of Enlightenment, painted in places, where I heard the music of the spheres. in natural or outer spaces of the vastness one can seldom see. Paintings inspired by my love for Mother Nature. She needs new scripts for future evolution! invite you into Infinity. Large oil Paintings. Exhalation of being, all-embracing universality, state of creative not-knowing. The deepest blue! check out even if you believe me! from what was done by millions artists before. Muscle and Nerve systems, Skeleton, Inner Organs, Face Zones, Reflexology Map, Similarities Atlas, Acupressure Points. and Paintings on Consciousness - State of Sleep, First Awakening, Awakened. where drawing lines is quicker than perceiving them. Using a single or several strokes to create an internal portrait of a person. To express the meaning of life, love and death riding on a one wave? See what I mean! Paintings of the Color Spectrum. Three basic Colors are the Trinity you find in your religion, if you have any. Red Yellow Blue - creating all that is visible. My latest passionate search for truth of the visible and latest technological discoveries. Seeking the healing energies of the color I painted huge paint-objects: Rainbow Hexagons and Rainbow Tower. Paint-Object of the Nonexistence, Aura of the Cross that is not there. Three basic acrylic colors on four raw canvases 140 x 140 cm, three basic brushstrokes, total size 500 x 500 cm. acrylics on cotton, 32 paintings 60 x 50 cm each, total size - 300 x 800 cm. Color Spectrum = Spectrum of Consciousness.